Get into the spring of things early and bring the outdoors in! We love the idea of decorating your home with some beautiful greenery. So we’re sharing some fresh ideas on how to decorate with houseplants. Not only will some natural greens inside the home cheer you up, it will help improve the air quality too! If you haven’t caught on to the air plant trend yet, not to worry! We’ll get you up to speed. They are small plants that require no soil, and a weekly water soak. We especially love them because they can be displayed in a very unique manner. Hang them in a dome like planter, or arrange them inside a terrarium. 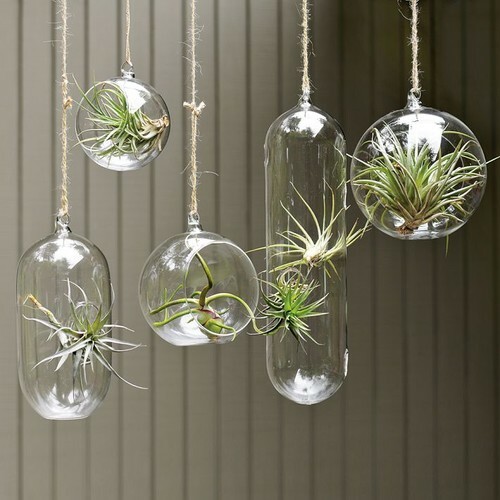 To learn how to properly care for air plants, click here. Succulent plants are a lot of fun to decorate with! They are rare, exotic looking, and very catching to the eye due to their thicker look. Try potting some cacti, aloe vera, jade, yucca, or hens-and-chicks for some extra added effect. You can easily add some small plants, potted or otherwise, to the empty surfaces of your home. Cluster them on bookshelves, in the office, or even on your fireplace mantel. We love this idea of displaying fresh cut flowers, or leaves in colorful bottles. While we love the look of photo to canvas prints up on the wall, incorporating some greenery is also a great idea. Fill up those blank spaces with some cool mounted wall plants. This is a great way to fill up the corner of a space, or add an extra something to any room in your home. Go big with some floor plants or trees. Don’t forget to get creative with what you pot them in! Hanging plants don’t have to be limited to the outdoors. They look great inside the home too! Hang some baskets in the corner of a room by the window, or try hanging some fresh herbs in your kitchen.